We’ve just updated the prices of new bikes in the Carnell-City section of Bikemart TM You’ll be amazed how much you can save. You could save £2000 on a Yamaha R1 or £1300 on an R6. If you’d prefer a Honda there’s a huge £1500 off the SP-1 and the VTR1000, £1750 off an X11 and £2400 off a year 2000 FireBlade. There’s just as big a saving on Kawasaki’s ZX-12R and you can get all 750cc of the Kawasaki ZR-7 for just £3695. Suzuki’s TL1000S can be yours at £1600 off list and if it’s a Hayabusa you are hankering after, there’s £1700 off. And those are just a few examples… think of a bike and you’ll find it at the right price in Bikemart TM. You can buy direct through Carnell-City and DK in our Bikemart TM section. That way you get the bike delivered to your door. And part exchange and finance at excellent rates can all be sorted with the minimum of fuss in the same deal. Don’t worry, you won’t be asked to input either your credit card number or your bank details. Find the bike you want, click to let them know you want it and you’ll get a telephone call back so you can deal with a real person. 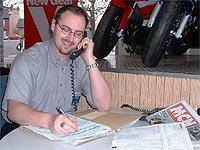 In Bikemart TM you will also find stock lists from other dealers… including used bikes.